It's taken some getting used to, having my devices now use USB-C instead of microUSB. That has meant keeping all my old microUSB cables (because of my accessories still use it to charge) and having cables/adapters for the USB-C stuff. It's a bit of a headache, and then with all the scare of 'is it compatible' it can be stressful. 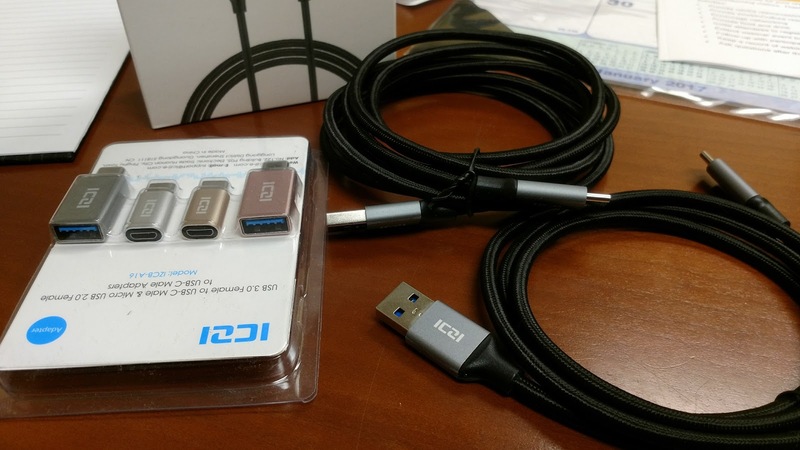 Well, I was sent a couple of ICZI's accessories: some microUSB to USB-C adapters, with USB-C to USB adapters, and then a couple USB-C cables. First up, the adapters. This is great, because I have TONS of cables everywhere. I bought some adapters previously, but they always say charging slowly" when I use them. 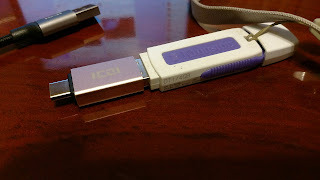 With the microUSB adapters from ICZI it may not allow 'turbo speed', but it's not limiting it down to nil. One issue I did have with them is that one of the sleeves came off. I'll have to get some glue to see if it'll re-stick. The other adapter is a USB-C to USB adapter. 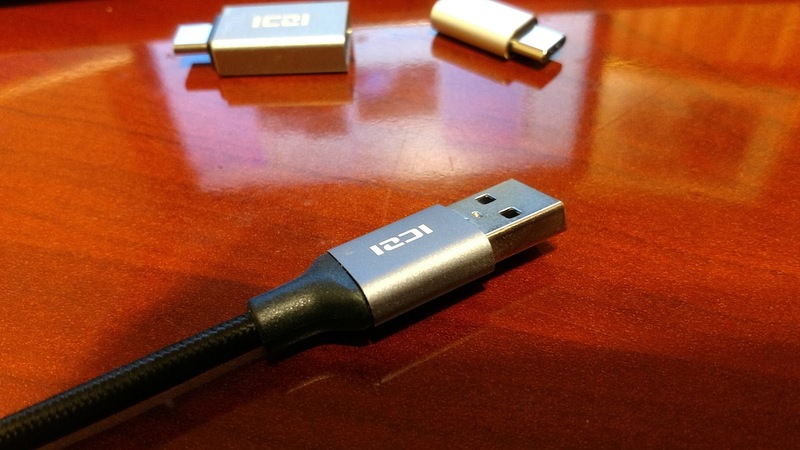 This would be handy for those laptops that only have USB-C ports now (see my review on the Tab S Pro). These are really nice. Solidly built, with a nice sturdy braiding. No twisting going to happen here. And the fixture from the wire to the connector is really sturdy, definitely not going to allow it to bend there (like my son just sits the phone on the couch on the cable, bending it at 90°). And then the casing around the connector. It's solid. It makes a nice 'ting' sound when it taps things, so to me... I feel secure. 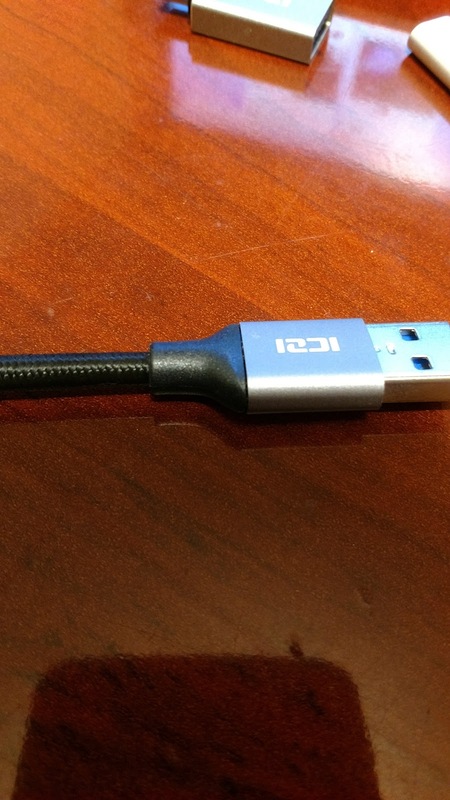 One thing to note, that despite them saying USB 3.0 support, it doesn't support turbo/rapid charge. I tried it out on a few of my Quick charge warts and my device never had the pop up notifying me that it's on turbo charge. I thought that was odd, and so I had to try it out on many of them. Maybe it's a safety thing with the cables. It still charged fairly quick with the 2.4A one, but not true Rapid Charge. Oh, well... can't win them all. You can't argue about the price tho', for $13ea (USD) it's not a bad deal. Best of all, I like that it comes with a velcro strap to keep the loose loops in check.